The BBC's long-awaited social network integration has arrived, as well as new-look channels for the website. The BBC's internet site is among the most visited in the UK, where the company has established itself as a key player, and one that is not afraid to innovate. Outlined earlier in July, the integration of Facebook and Twitter into the site has now been rolled out, allowing people to share the content that they like among their social contacts. 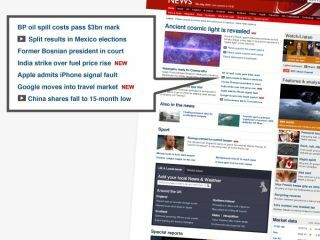 "We have focused on design and navigation, looking to see how we can make all the existing content we produce each day easier for you to find, use and share," said Steve Hermann, editor of BBC News, in a blog last week. So you can now Facebook Like or Tweet a story, and also see which stories have been liked or tweeted by your friends. Also of note, for technology fans, the BBC Technology news page is among those given an overhaul.